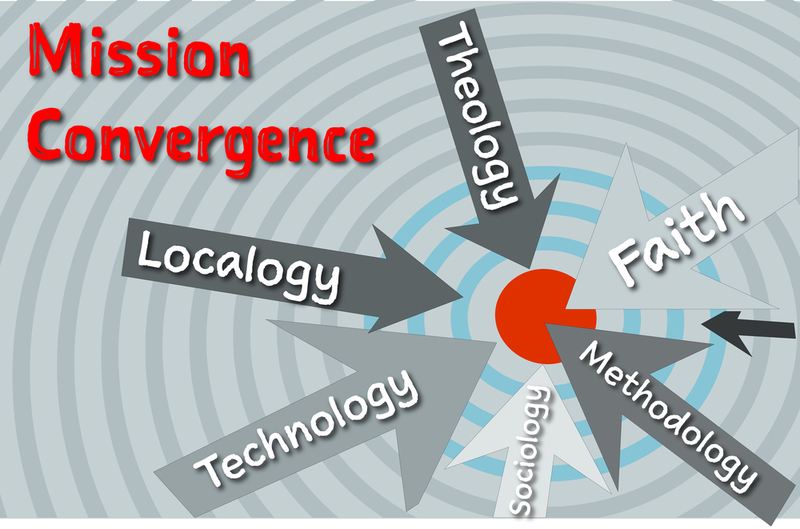 The intersection of your mission convergence is affected by forces. Are you paying attention? Building on theological and historical foundations, how can we build a more comprehensive, authentic, and effective mission framework that interconnects faith and context. Forces at Mission Convergence can mobilize worshipping communities to be more passionate and courageous in its mission to achieve greater impact. The methodology of mission is about not what the church has to offer (which is huge, of course), but considers what pushing and pulling forces are at work in an individual’s decision-making processes that result in exchanging their resources (time, attention, money, etc. ), for what they need to get done in their life at that moment. (A great starting place for a useful Jobs To Be Done methodology as it relates to life-choices is Clay Christiansen’s masterful treatments of innovation and change (as in his latest and highly recommended book, How Will You Measure Your Life?). What jobs need to get done by the community? Instead of generalizing what they need, consider what jobs youth, for example, between the ages of 17–25, during the hours of 6PM and 11PM, on weekdays, need to get done. A sense of purpose, to be liked, a place of safety, help with education and school choices, relationship issues. The list goes on and one. But in any moment of time, a particular individual is considering a narrow range of choices that push toward a decision. Where does the church, through its people and resources, help those youth, in our example above, get those particular jobs done?This line of analysis has been generative for me as I resource leadership teams striving to make a significant impact on their communities that aligns with their congregation’s mission convergence. At a congregations’ anniversary service, I asked a just-welcomed new member, What was the job this church helped accomplish in your life? Umm, never thought about that. (Pausing a few moments, the new member said): I think I needed joy, a place to connect with people, again. About 9 months ago, after a relationship crumbled, I needed to feel safe, like I was connected to something that mattered. I enjoy the arts, heard that this church loved music and the arts, so I came here. I knew immediately I connected. I have a place to contribute now. I walk out to the parking lot after church and am so glad I was here. What job was the church hired to do? He needed a place where music and the arts was part of the social experience. A hang out, that was safe and engaging. Wonderfully, that person was also introduced to Jesus Christ, and transformation changed his life. However, from our point of view, Jesus was not the reason he came to church. He did not look for a pastor. It wasn’t looking for spiritual nourishment. He essentially hired the church to help him connect with people again around music and the arts. What is the job needing to be done that the community needs the church to do, now? Instead of generalizations, aiming at everything and hitting nothing… Could, for example, a community’s search for a sense of justice and peace for kids “hire” the church to do that job? Crazy, right? What would a jobs to be done framework look like in terms of mission and ministry? Where would resources, priorities, and processes need to be realigned to do particular jobs? Guessing here, the alignment probably has little to do with Sunday school, choir practice, better preaching, cushioned pews, a large screen in front of the chancel, or changing the sermon titles on the outside message board (that nobody can read anyway?). Disciples of Jesus have an opportunity to make time for focused listening to pay attention to the jobs individuals and entire communities need to get done. The church can be hired to accomplish those tasks in people’s lives and through that relationship, change and growth of the most significant kind will be experienced. Instead of thinking about church as a finite container of the infinite Spirit, with its pre-assembled packages of goodwill, goodness, and good cheer, it occurs to me that while Jesus’ atonement would be considered comprehensive on the cross, Jesus was attentive to granular acts of good news that were hyper-contextual, and specific, and as a result, strategic in impact. Jesus did not just have good intentions. He did not merely exert effort. Jesus wasn’t solely focused on high productivity with good outputs. Taking a deeper look, Jesus’ life had impact. Relevant, measurable, and strategic impact. I think Jesus’ disciples should strive to do the same. His acts set in motion behaviors that if modeled, would transform, (did transform) the world. I think we too quickly dismiss these jobs Jesus was hired to do, such as sight by the blind man, water for the woman at the well, or mobility for the leper, because Jesus, who knows all things, (super)naturally did all things. Judas, for example, wanted to hire Jesus to deliver his country from the Romans. Well, Jesus wasn’t taking that job. Since we don’t have Jesus’ divine attributes, but we do have the divine Spirit, we are invited to do the hard work, and pay attention with the same granularity to do what God uniquely calls us to do, measuring for impact, not effort. What impact have you measured, lately at your mission convergence? Let’s learn from each other.